And aren’t the majority of the horses in the Show Jumping Hall of Fame Thoroughbreds? Aren’t they those courageous, never-say-die horses that go plunging into the deep water of impossible cross-country courses? Aren’t they those elegant, balanced dancers that ballet their way through impeccable Grand Prix dressage tests? What about the OTTBs working in therapy jobs, as kid’s mounts, and as lesson horses? Could they possibly be just warm, sweet, huggable teddy bear ponies that will do anything for a cookie? Well, which is it? What is an OTTB? Don’t over-think it; there’s no need to find the perfect label. Thoroughbreds have been pigeon-holed into narrow little stereotypes for years, but the truth is, these hot-blooded princes (and princesses) of the turf are anything but one-dimensional. 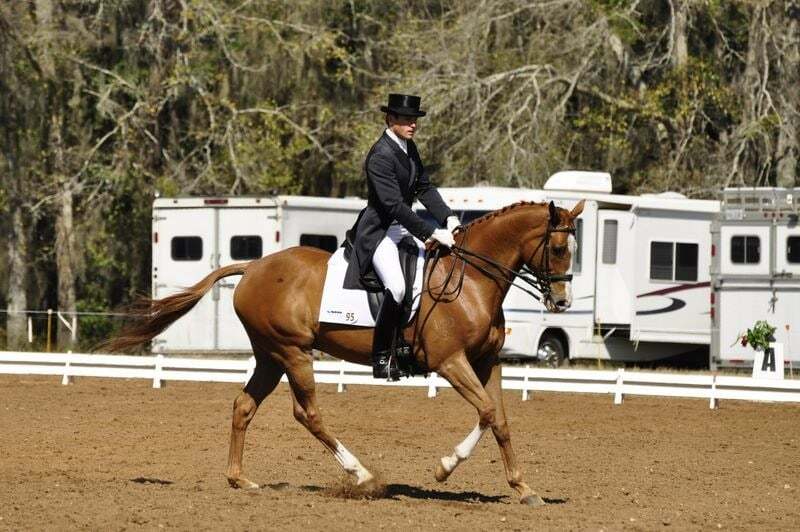 OTTBs can do every sort of discipline, and they do it with style. Here’s the skinny on those skinny Thoroughbreds. 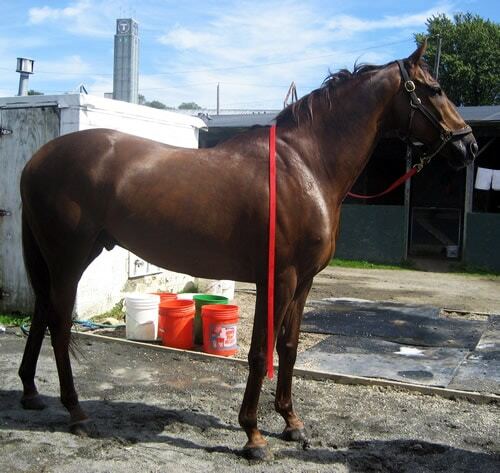 There is a saying in the horse world: “typical hot Thoroughbred,” and nearly everyone is guilty of using it. 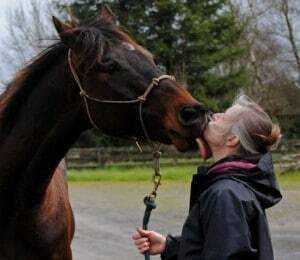 The fact is, at some point we will come into contact with a hot Thoroughbred and that horse will confirm all the stereotypes we have ever heard about them. No one has ever said “typical lazy Thoroughbred,” probably because a lazy horse does not leave the same impression as a hot one, but they certainly exist. While every horse has its own personality, Thoroughbreds who have just been retired may seem universally hot. That’s reasonable. After all, if a horse has been living in a controlled, semi-industrial urban landscape, stuffed to the gills on high-sugar feed, ridden to eye-popping physical fitness, and required to gallop at top speed, a rather hot personality would be the expectation, right? But that is rarely the whole story. OTTBs who have had some transition time to learn to socialize with horses, humans, and just “be a horse” often settle into sensible, enjoyable mounts. Aftercare agencies which specialize in placing OTTBs into new homes typically give their horses some down-time before they offer them for adoption, meaning their horses are frequently more quiet and relaxed than a horse purchased directly from the racetrack. Like any horse, a Thoroughbred, judged on his own merits, transcends stereotype. 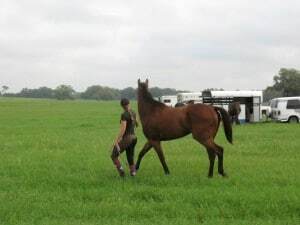 It can be just as challenging to describe a Thoroughbred’s body type as their personality, and an OTTB can literally come in every shape or size imaginable. You can even find, if you so desire, a pony-sized OTTB. A square, rough-and-ready, close-coupled OTTB. A tall, lanky, greyhound of an OTTB. 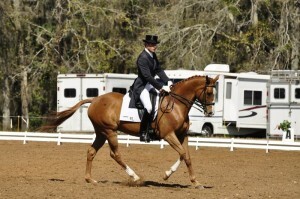 A sturdy, durable cow-punching-type horse or a graceful, elegant dressage-type horse. With Thoroughbreds, the choice is yours. The reason? 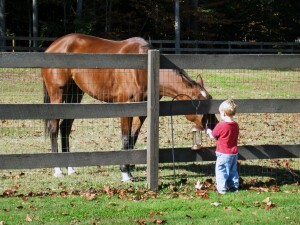 Within racing, different bloodlines are honed for different purposes. A five- or six-furlong sprinter will bear more resemblance to a Quarter Horse than a tall, gazelle-like horse bred to run a classic mile-and-a-half or more, and the sprinter is more likely to be 15 hands and a few inches than 16 or 17 hands high. At the same time, because the gene pool is so small — worldwide, Thoroughbred stud books are closed to outside breeds — even a 15-hand, close-coupled Thoroughbred is going to bear a certain resemblance to a 17-hand, “legs-all-day” cousin! Fortunately, what Thoroughbreds share in conformation are generally wonderful things indeed: a deep chest, a long sloping shoulder and a similarly angled hip, an elegant neck, and wide-set, intelligent eyes. While some may be narrow and some wide, some may be tall and some short, all OTTBs are going to have the family look. Although there will always be an OTTB that finds the inside of his feed bin far more interesting than anything that could be happening outside, Thoroughbreds are generally sensitive creatures who require equally sensitive handling. One thing is certain: Thoroughbreds prefer to be in motion. It is their automatic response to any stimulus, and handlers who are new to OTTBs should learn first and foremost: When in doubt, get moving! That’s how writer John Jeremiah Sullivan describes Thoroughbred yearlings in his book Blood Horses. The unsettled babies about to go into the auction ring at Keeneland grow somewhat more settled when they are four, five, or six years old and seeking a new career as a riding horse. They have seen more of the world, they have grown to know what to expect. But their need to be in constant, flickering motion has not ceased in all those years. There are limited or no options for exercise outside of the daily workout and hand-walk at the racetrack, which can instill a frustrated sense of confinement. Bred to be in motion, then denied the ability, Thoroughbreds tend to be impatient with restriction. Their inborn sensitivity, while not in question, can be soothed with a sensible training strategy: Calm hands, calm voice, and reasonable requests; a devotion to routine; an understanding of their desire to stretch out and stay in motion and an ability to cooperate with that need. These tools, put together, are invaluable in developing a partnership that will last with an OTTB. For every story of a mad Thoroughbred who could not be tamed, there are ten tales of a life-changing best friend, a legendary spirit, the sort of partnerships that are written about in books or made into Walt Disney movies. 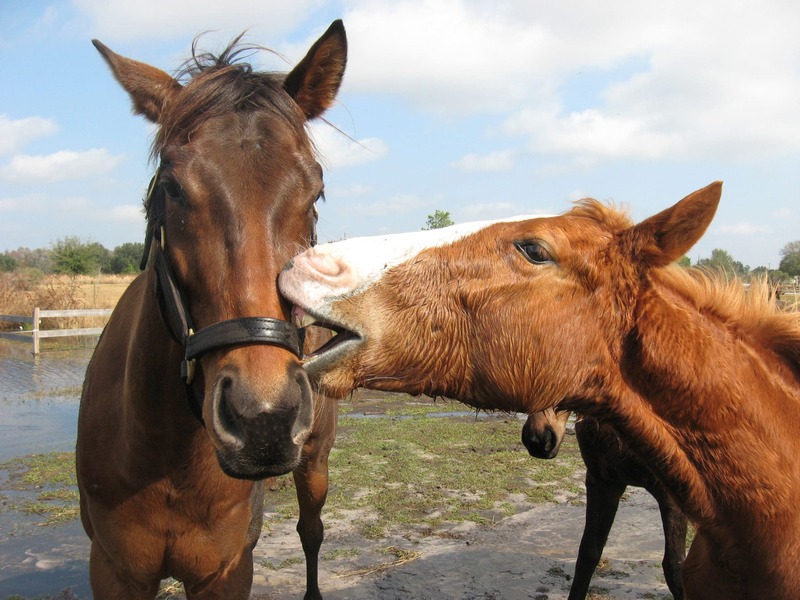 Those enchanting, seemingly-magical bonds are something that horse lovers encounter every day in every breed of horse; the spectacles that are part of the truly other-worldly connection between horses and humans. They are no less common for OTTBs than they are for Quarter Horses, or Morgans, or Arabians. And they have experience that few other horses can boast. OTTBs have seen it all. From an early age, Thoroughbreds are getting on and off horse trailers and semis, traveling the interstates from breeding farm to training center to racetrack and back again. They are poked and prodded by vets, they live next to highways and are surrounded by heavy equipment, they perform in front of screaming, shouting hordes of people, they are expected to adjust instantly to changes in riders, grooms, trainers, even whole barns. Their entire experience of the world is one of whirlwind change and endless noise. And when they have left all that behind, learned to play in a paddock with a friend, walk nicely without a chain over their noses, and do strange new things like stand in a cross-tie to be groomed, they come to their new riders with a wonderful support network. The OTTB community is growing by leaps and bounds with trainers, enthusiasts, and owners sharing advice, help, and solutions. And so I ask, what is an OTTB? What is an OTTB to me? Aside from a big sloppy smooch (as you can see), he is my mirror. He tells me very definitely what I need to work on. My seat. My energy level or attention span. He doesn’t always tell me how–he’s like Yoda that way–but he always points out where work is needed. He is my teacher and mentor as much as I am his. He is my horse and I am his human. We make funny pictures together.